The award, reserved for songwriters, was first presented to English musician Sting in 1992. According to the category description guide for the 52nd Grammy Awards, the award honors new songs (containing both melody and lyrics) or songs "first achieving prominence" during the period of eligibility. Songs containing prominent samples or interpolations are not eligible. 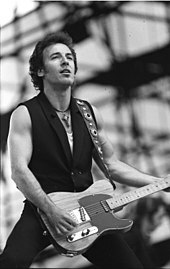 Bruce Springsteen holds the records for the most wins and nominations, having won four awards from nine nominations. Other winners of multiple awards include Alanis Morissette as well as the bands Red Hot Chili Peppers and U2, with two. Award-winning songs have been performed by American artists more than any other nationality, though they have also been performed by musicians or groups originating from Canada, Ireland, and the United Kingdom. 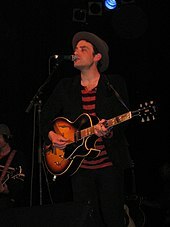 There have been four instances in which one artist or group was nominated for two works in the same year: the group Aerosmith was nominated for both "Cryin'" and "Livin' on the Edge" in 1994, Melissa Etheridge received nominations for "Come to My Window" and "I'm the Only One" in 1995, Jakob Dylan of The Wallflowers won for "One Headlight" and was also nominated for "The Difference" in 1998, and U2 was nominated for the songs "Elevation" and "Walk On" in 2002. Coldplay holds the record for the most nominations without a win, with four. 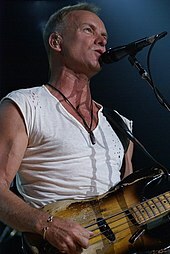 Sting became the first award recipient in 1992 for the song "The Soul Cages". "Grammy Awards: Best Rock Song (Songwriter's Award)". Rock on the Net. Retrieved November 16, 2010. ^ "Grammy Awards at a Glance". Los Angeles Times. Tribune Company. Archived from the original on March 9, 2012. Retrieved April 24, 2010. ^ "Overview". National Academy of Recording Arts and Sciences. Archived from the original on October 27, 2009. Retrieved November 11, 2010. ^ "52nd OEP Category Description Guide" (PDF). National Academy of Recording Arts and Sciences. p. 2. Archived from the original (PDF) on October 27, 2009. Retrieved November 15, 2010. ^ "Nominees announced for Grammy Awards". TimesDaily. 123. Florence, Alabama. January 8, 1992. p. 10B. Retrieved November 17, 2010. ^ "The 35th Grammy Awards Nominations". Los Angeles Times. Tribune Company. January 8, 1993. p. 3. Retrieved December 12, 2010. ^ "General Categories". Los Angeles Times. Tribune Company. January 7, 1994. p. 3. Retrieved December 12, 2010. ^ "The 37th Grammy Nominations". Los Angeles Times. Tribune Company. January 6, 1995. p. 3. Retrieved December 12, 2010. ^ "List of Grammy nominees". CNN. January 4, 1996. Retrieved November 11, 2010. ^ "The Complete List of Nominees". Los Angeles Times. Tribune Company. January 8, 1997. p. 3. Retrieved December 12, 2010. ^ "List of Grammy award nominations". CNN. January 6, 1998. Retrieved December 9, 2010. ^ "1999 Grammy Nominees". NME. IPC Media. November 27, 1998. Archived from the original on October 11, 2012. Retrieved November 11, 2010. ^ Boucher, Geoff (January 4, 2001). "Grammys Cast a Wider Net Than Usual". Los Angeles Times. Tribune Company. p. 5. Retrieved December 10, 2010. ^ "Complete list of Grammy nominations". The Seattle Times. The Seattle Times Company. January 4, 2002. Retrieved December 10, 2010. ^ D'Angelo, Joe (February 23, 2003). "Norah Jones Sweeps Grammys, Boss Wins Three, Avril Shut Out". MTV News. Retrieved February 11, 2019. ^ "Complete list of Grammy nominations". The Seattle Times. The Seattle Times Company. December 5, 2003. Retrieved December 10, 2010. ^ "Grammy Award nominees in top categories". USA Today. Gannett Company. February 7, 2005. Retrieved November 11, 2010. ^ "Complete list of Grammy Award nominations". USA Today. Gannett Company. December 8, 2006. Retrieved December 9, 2010. ^ Kaufman, Gil (December 7, 2006). "Mary J. Blige, Chili Peppers Top Grammy Nominations List". MTV. Retrieved December 9, 2010. ^ "2008 Grammy Award Winners and Nominees". The New York Times. The New York Times Company. February 9, 2008. Retrieved November 17, 2010. ^ "Complete List of Nominees for the 51st Annual Grammy Awards". E! Online. December 3, 2008. Retrieved December 9, 2010. ^ Partridge, Kenneth (December 2, 2009). "Nominees for 2010 Grammy Awards Announced -- Full List". Spinner.com. Retrieved November 16, 2010. ^ a b c "Nominees And Winners – GRAMMY.com". National Academy of Recording Arts and Sciences. Retrieved February 13, 2011. ^ Ward, Kate (February 12, 2012). "Grammys 2012: Winners' list". Entertainment Weekly. Retrieved February 11, 2019.